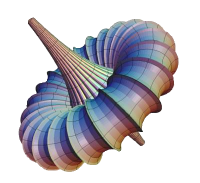 3D-XplorMath-J, Version 1.0 is a program for visualizing and experimenting with a variety of mathematical objects or "exhibits." It is written in the Java programming language; to use it, you must have Java 5.0 or higher installed on your computer. It is a complete revision of an older program, 3D-XplorMath (which runs only on Macintosh computers). While it still lacks some of the features and exhibits of the original program, 3D-XplorMath-J, Version 1.0 is ready for serious use and has unique features of its own. Several languages are supported in 3D-XplorMath-J. Note, however, that the translation is incomplete for some languages, and parts of the program and documentation might be in English. 3D-XplorMath, 3D-XplorMath-J, and this web site are projects of the 3DXM Consortium, an international volunteer group of mathematicians, and are supported in part by The National Science Foundation (DUE Award #0514781). to download Ulrich Pinkall's marvelous "3D-XplorMath-J meets jReality". This is an amazing and delightful marriage of 3D-XplorMath with jReality that allows you to create an object in 3D-XplorMath-J and then, with a click of your mouse, to import it into jReality and play with it there. For more information about jReality look here. To use the applets, you must use a Web browser in which Java 5.0 is enabled.